Map of Asia Minor/Anatolia in the Greco-Roman period. Aeolis (Ancient Greek: Αἰολίς, Aiolís), or Aeolia (/iːˈoʊliə/; Αἰολία, Aiolía), was an area that comprised the west and northwestern region of Asia Minor, mostly along the coast, and also several offshore islands (particularly Lesbos), where the Aeolian Greek city-states were located. 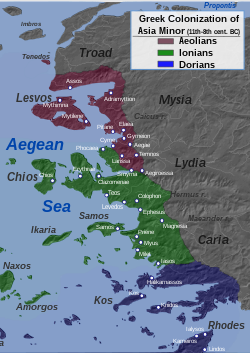 Aeolis incorporated the southern parts of Mysia, which bounded it to the north, Ionia to the south and Lydia to the east. According to Homer's Odyssey, Odysseus, after his stay with the Cyclopes, reached the floating island of Aeolia, where Aeolus son of Hippotas provided him with the west wind Zephyr. By the 8th century BC the Aeolians' twelve most important cities were independent. They formed a league of twelve cities (a Dodecapolis): Cyme (also called Phriconis); Larissa; Neonteichos; Temnus; Cilla; Notion; Aegiroessa; Pitane; Aegae; Myrina; Gryneion; and Smyrna. 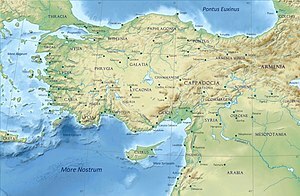 The most celebrated of the cities was Smyrna (modern Izmir, Turkey), but in 699 BC, Smyrna became part of an Ionian confederacy. This league or confederation, known as the Ionian League, also called the Panionic League, was formed at the end of the Meliac War in the mid-7th century BC. Croesus, king of Lydia (reigned 560-546 BC), conquered the remaining cities. Later they were held successively by the Persians, Macedonians, Seleucids, and Pergamenes. Attalus III, the last king of Pergamum, bequeathed Aeolis to the Roman Republic in 133 BC. Shortly afterwards it became part of the Roman province of Asia. At the partition of the Roman Empire (395 AD), Aeolis was assigned to the East Roman (Byzantine) empire and remained largely under Byzantine rule until the early 15th century, when the Ottoman Turks occupied the area. ^ http://www.perseus.tufts.edu/hopper/text?doc=Perseus:text:1999.01.0218:book=10:card=1 - "Thence we went on to the Aeolian island where lives Aeolus son of Hippotas, dear to the immortal gods. It is an island that floats (as it were) upon the sea, iron bound with a wall that girds it." ^ Herodotus. The Histories: 1.149. Compare Ionian League. ^ Editors (2005). "Recent Finds in Archaeology: Panionion Sanctuary Discovered in Southwest Turkey". Athena Review. 4 (2): 10–11. Retrieved 2018-05-30. ^ Smyrna fell to the Seljuk Turk Tzachas in 1076, to the Turkish Beylik of Aydın about 1330 and to the Turco-Mongol Timur in 1402 (after the Siege of Smyrna).